My husband wanted to have a Good Friday bunch after church. He wanted bacon, eggs and french toast. Often, when we have something like that, I'd just eat what I can and not worry about the rest but this time I decided I wanted to try and make some french toast that I can eat. It was a nice surprise! I want to play around a bit and see if I can get the egg mixture to stick to the sweet potato a bit better but for now, this was good. If you are eating AIP, you need to know that this isn't compliant as it has eggs and almond milk. But once you successfully re-introduce those things, this is something you can try! All I did was slice the sweet potato and toast it in the toaster. I found that the thinner slice was better than the thicker slice. I toasted it two or three times ... til it was browned. Then I made the 'batter" just like normal french toast. I used an egg, some almond milk, homemade vanilla extract, and a bit of cinnamon. Dip the toasted sweet potato slices into the batter and then cook in an already heated fry pan. 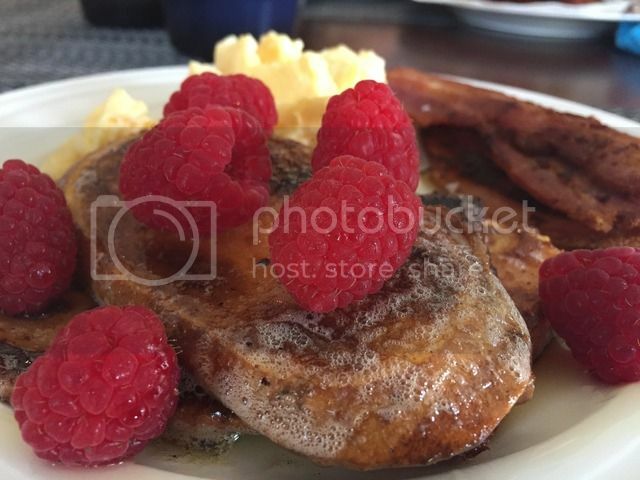 I topped the toast with a bit of pure maple syrup and fresh raspberries. And we had scrambled eggs (I just do eggs with nothing added) and some AIP compliant bacon. A delicious Good Friday brunch!